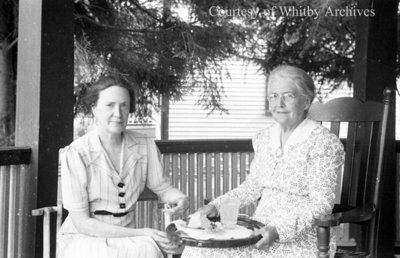 A black and white negative of Ethel McMillian (left) and Mrs. Graham (right) sitting on a porch in August of 1939. In this view Mrs. Graham is holding on to a tray that is on her lap. Ethel McMillian and Mrs. Graham, August 1939, Marjorie Ruddy. Whitby Archives A2013_040_681A.